Most of those who know about the tatara – the traditional Japanese iron ore reduction and steel smelting furnace – think of actually only one type called the kera-oshi tatara. There exist indeed two main types to which in the West we would refer to as low-furnace and high-furnace. 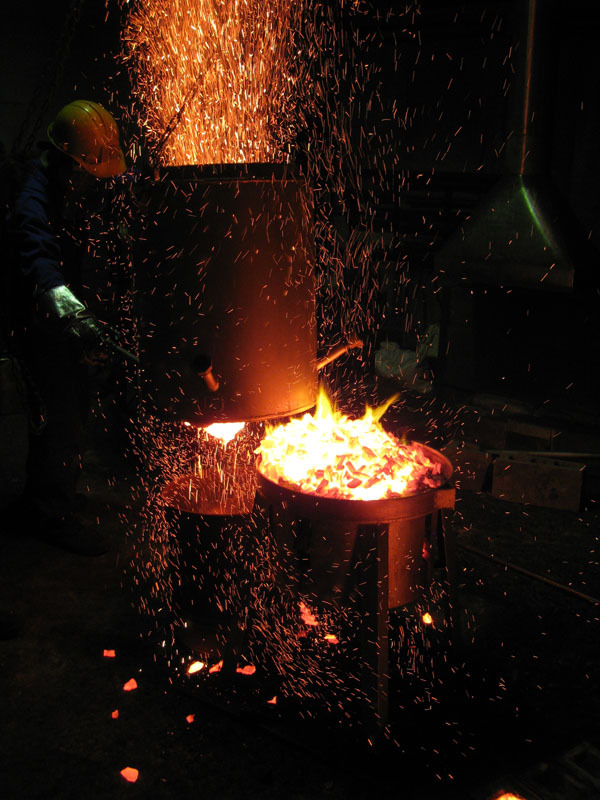 If the low-furnace, or kera-oshi tatara, produces a heterogeneous lump of iron, steel and lots of slag, the high-furnace, or in Japan zuku-oshi tatara, produces on the other hand cast iron without any slag, but with an excessively high carbon content which prevents its use in the forge. 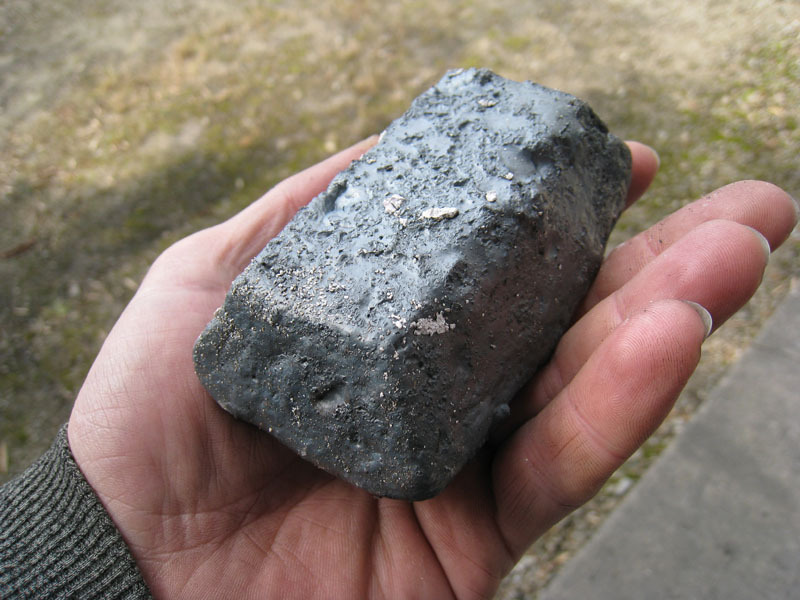 The cast iron thus manufactured, called pig iron in the West, must then be decarburized, a process referred to as sage in Japanese. 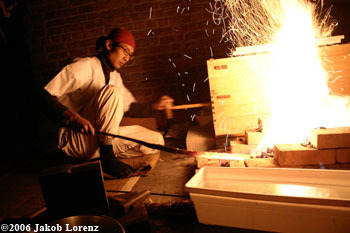 Manabe Sumihira is one of a handful of Japanese swordsmiths to operate a tatara on their own. Moreover, in Mr.Manabe’s case it is of the zuku-oshi type. There are in Japan only a limited number of individuals to do so, and one of them is an early mentor of Mr.Manabe’s, « Living National Treasure » Amada Akitsugu. Which is the « right » process? I am presently working on an article on the history of the evolution of the tatara and their steels in Japan. It is not an easy task, and many questions remain unanswered. It would appear, however, that the zuku-oshi tatara would have taken a growing place in importance throughout Japanese history, starting around the 6th century. Both processes have always been used, but the proportions clearly leaned towards cast iron at least during the Edo period, of which remain many documents and evidence to establish the kera-oshi tatara was no longer the major method. Today, the NBTHK produces the steel used as the main source of raw material for the majority of Japanese swordsmiths with a kera-oshi tatara, having de facto diminished the importance that should have been accorded to the zuku-oshi process. Many archeologists and most swordsmiths of the 20th century believed for a long time that the kera-oshi was the main method of production, if not the only one in Japan! Here we are and the inverse hypothesis is gaining ground. The article I propose will aim to expose the known details of history, including the reasons behind the NBTHK’s choice to use a kera-oshi instead of a zuku-oshi, but in the mean time I invite you to simply visit Manabe Sumihira and his zuku-oshi tatara! Mr.Manabe has for the past thirty years single-mindedly pursued the quest for the rediscovery of steels of the Japanese Middle Ages, the Golden Age of Japanese swords. He tends to believe that the solution lies on the side of the zuku-oshi tatara, and has been operating his own for the past fifteen years. He has in the past won several awards for his work, but more recently distanced himself from the establishment in order to conduct his own exploratory experiments without the frowning faces of the authorities. I spent a full week during this October 2009 at Mr.Manabe’s to help as much as possible, but to also drown him in questions and mostly learn as well. With the hope that this humble insight widens a little more the window into the world of Japanese swords! I invite you to visit the image gallery where I uploaded a number of pictures taken during these sessions. 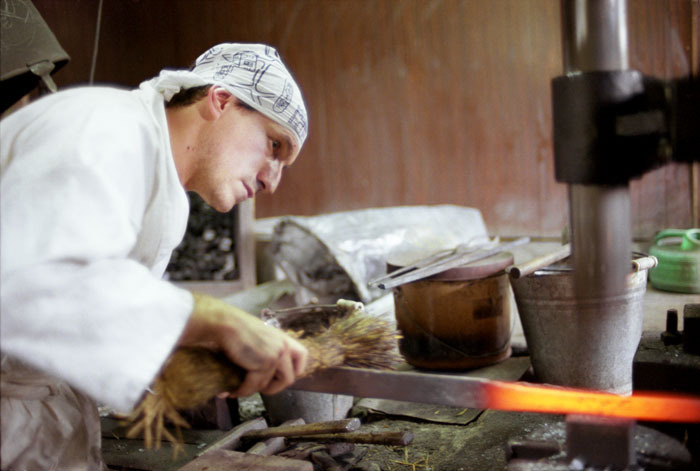 Posted in Craftsmen, The Making of Japanese Swords, Uncategorized.